Miniature Garden ~ Fairy Garden. By Top Collection from Top Land Trading. Doing that is against U.S. and international laws. Lot 10 Ceramic Acorn Candle Holders or. Seasons of Cannon Falls. 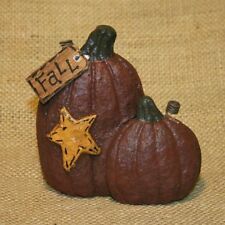 POTTERY BARN DRIED PUMPINO VASE FILLER – NIB – MINI-MIGHT FOR A GRAND DISPLAY! There’s nothing quite like dried pumpkin pods (or,pumpinos ) to create the appealing aura of autumn. We try to include every important detail about each item, so what you see and read is what you will get! 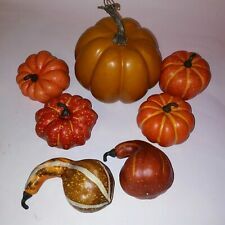 Pumpkins & Gourds. Fall Decor. 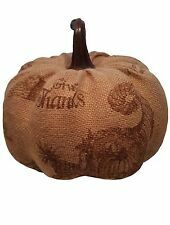 ---This metal pumpkin with floral arrangement measures approximately 10" x 10" x9". ---The floral arrangement is artificial. ---PLEASE SEE THE PHOTOGRAPHS FOR CONTENT AND CONDITION. Item #15-7 15-0358 Payment or contact to be made within 5 days of the end of the auction or an unpaid claim case will be opened so item can be re-listed and the eBay fees refunded. We combine shipping on 2 or more items whenever possible. INTERNATIONAL BIDDERS WELCOMED: International customers are responsible for all duties & taxes that may be due upon delivery. Excellent Pre-Owned condition. Runner 70" by 14". Napkins (6) 16" by 16". 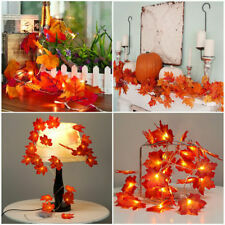 Very colorful and realistic grapevine garland. Very sturdy. Perfect condition. Can be bent to alter the shape. Embroidered Suede Fall Leaves Thanksgiving & Fall Decor Table Runner 68"x 13"
Features applique faux suede Autumn fallen leaves in a beautiful collage design. Warm colors of burnt Orange, Gold, Brown and dark Russet with Bronze embroidery highlights. Brown fabric lines the back to complete the piece. It has hand stitching throughout and thin batting inside. It is in very good condition except for a few spots on the back. 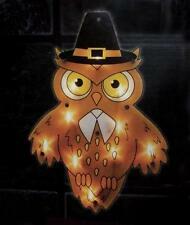 Scarecrow Wall Hanging. It's hard to see but it says Hallmark Cards Inc on the bottom. The door covers can easily be attached to walls or doors with Sticky Tape. Price is for ONE door cover. Door cover only! Just let us know what you need! Can be used indoors or out. Big faux food soft PVC Vinyl Blow-up Turkey Leg. Award the biggest "TURKEY" at any sports banquet or corporate awards night, your next Ren-Faire or family Turkey Bowl! Indoor or Outdoor use. Beautiful pilgrim pair is made from resin and painted in rich autumn colors. Pilgrims - Set of 2. White Blown Glass Pumpkin. Hand blown white glass pumpkin. Wedding Light Up 7.5" x 7.25". Pre-owned -- Used for a few hours at a wedding. Color : White & clear. Size : 7.5" x 7.25". 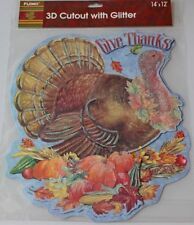 Thanksgiving and Fall Hanging Wall Decor Turkey Pilgrim Flag Huge 39" x 27.5"
4 piece Pilgrim family Thanksgiving figures Sculpture Figurine 19"
This is for 4 piece Pilgrim family Thanksgiving figures 19" Tall in box. Like New condition. Vintage Thanksgiving Indians Figurine Set Table 12"
(2) 10.5" Taper candles. Appears to have been displayed but never lit. Ceramic Orange Pumpkin Covered Bowl / Cookie Jar w/ Lid. She is made by Audrey's Your Hearts Delight. 15" long from top to bottom. She is tea stained to make her look old. There is a string at the back of her neck so that you could hang her. Each apple has a rich, deep red glossy finish and is attached to a flexible brown wire. Supplied in a box. Quick dispatch from a trusted UK supplier. All sizes are approximate. Use to make a maple wreath. It can be used outside and will not easy to fade or falling off, even under wind, rain or sunshine. Encircle a basket or vase and add a candle or a bunch of flower to make a simple, elegant centerpiece. 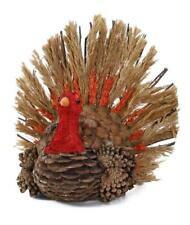 A beautiful autumn table decoration that would make any Thanksgiving table look elegant! This pretty fall candle table centerpiece has two elegant 10 inch yellow/ivory taper candles surrounded by a mixture of fall flowers which includes sunflowers, berries, thistle, fall leaves, orange filler flowers, white accent flowers, a white pumpkin, light lavender spray flowers and greens. The flowers are arranged in a green base. 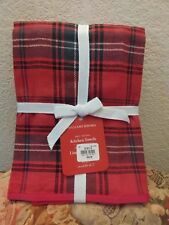 This lovely holiday decor measures approximately 14x8, 14x14 with candles. The candles stand in plastic holders and can be replaced so that the piece can be enjoyed for many years on your dining table! Additional matching pieces can be made. Painted on Rusty Shingle~~Unique! Black Bird CROW, RAVEN. A bundle of 5 dark brown stems of hawthorn-type autumn berries and green leaves. Internally wired stems to make arranging easy and the bundle is bound with a natural raffia tie. Available in Blue, Burgundy and Green. 2 Color Clings Window Borders 3 Reusable Borders On Each Sheet. Sammy Salvage Scarecrow is a plush scarecrow doll with. Sammy Salvage Scarecrow. Item(s) can not be washed or used. Pair Of Scarecrow Shelf Sitters. Autumn Harvest. Girl and Boy Scarecrows. 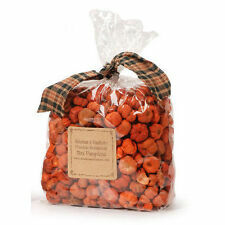 1 Bag of 16 Piece Small Assorted Gourds in Pretty Assorted Fall Colors. Also available in 12 & 14 & 16 Piece Sets - All Different Styles & Colors. Antique Led crystal wall sconce lamp hallway LED wall light fixtures mirror lamp. Long antique outdoor wall sconce lamp Balcony big waterproof glass garden light. blue bell crystal Chandelier hanging Lamp Dining room Restaurant Bar cafe light.